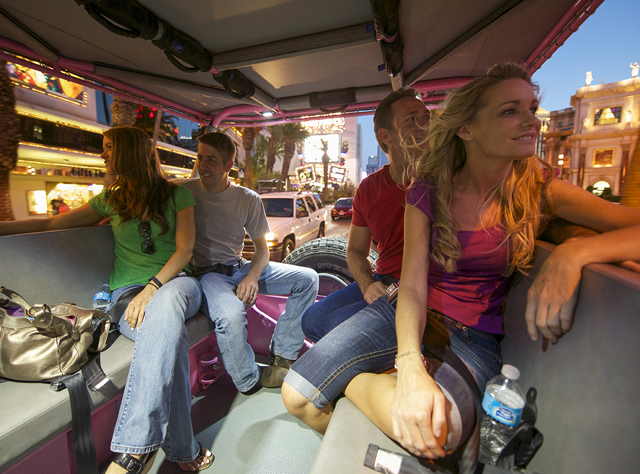 What could be better than exploring the bright lights of Las Vegas in an open-air Pink® Jeep® Wrangler? Adding a helicopter to your tour! Your introduction to the strip begins with the iconic neon of the “Welcome to Fabulous Las Vegas” sign, which has been a staple in films and TV for decades. Your local Certified Interpretive Guide will offer unique insights into the landmark and snap your group’s photo. Then it’s time to explore other famous attractions, such as the Gold and Silver Pawn Shop from the History Channel’s “Pawn Stars.” A quick stop at Wedding Chapel Row will give you a glimpse into the city’s legendary status among couples seeking unique nuptials. Your next destination is the over-the-top entertainment extravaganza of Fremont Street. You’ll have time to explore and watch the spectacular light show on the world’s largest video screen with more than 12 million LED lights. This four-block stretch is the perfect place to capture photos and videos that will make your friends wish they’d made the trip. Now you’re in for a Las Vegas experience like no other. Soar over the brightest city in the world while taking in the birds-eye view of a luxury helicopter. You’ll pass famous landmarks like Stratosphere Tower, Caesars Palace and the Bellagio fountains. Next, spot the skyline of New York-New York and the beam atop the Luxor pyramid. This airborne adventure is the only way to experience the beauty of the Las Vegas strip in all its shimmering glory. It’s also the perfect way to get an orientation to the city while setting the tone for the rest of your visit. We can’t wait to share this once-in-a-lifetime experience with you! Child rates apply to children 3 to 12 years of age. Go all out with this Jeep-to-helicopter adventure. Enjoy free hotel pickup and drop-off . Roam the city in a custom open-air Pink® Jeep® Wrangler. Snap an iconic photo in front of the famous “Welcome to Fabulous Las Vegas” neon sign. Capture photos as you cruise by the Gold and Silver Pawn Shop from TV’s “Pawn Stars”. Stop by Wedding Chapel Row and learn about the city’s legacy in the wedding industry. Take a 40-minute stroll down Fremont Street to see its 12 million lights and the world’s largest video screen. Get an unbelievable aerial view of the bright Vegas lights with a luxury helicopter ride. See iconic spots like Stratosphere Tower, Luxor pyramid and Bellagio’s fountains from the air. Tour operates Sunday – Thursday. No children under 18 mos. permitted on tour.